"We have a compelling basis for appeal, we just need a rock solid brief for the Ninth Circuit." Blue Fox Entertainment has debuted the first official trailer for Saint Judy, a drama which first premiered at both the Los Angeles Film Festival and Raindance Film Festival last year. The film tells the story of immigration attorney Judy Wood, and how she single-handedly changed America's Law of Asylum to save women's lives. This case has gone on to save the lives of thousands of other persecuted women around the world. Michelle Monaghan stars as Judy, and the film has drawn comparisons to Erin Brockovich. The cast includes Leem Lubany, Common, Alfred Molina, Alfred Woodard, Peter Krause, Waleed Zuaiter, Gabriel Bateman, Ben Schnetzer, and Mykelti Williamson. This looks like a powerful, inspiring, honest story. Saint Judy tells the inspirational true story of immigration attorney Judy Wood (Monaghan) and her fight that changed American asylum law forever. In her first case, Judy represents a woman forced to flee her home country after being persecuted by the Taliban for opening a school for girls. While juggling her life as a single mother, Judy fights tenacious battles in and out of court, not only saving her client's life, but also changing the Law of Asylum in the United States. This case has saved the lives of thousands of other persecuted women around the world. Like Erin Brockovich, Saint Judy tells the story of a remarkable woman who overcame tremendous odds, and reminds us how one person can change the world. Saint Judy is directed by American filmmaker Sean Hanish, director of the films 29 and Holding and Return to Zero previously. The screenplay is by Dmitry Portnoy. This premiered at the Los Angeles Film Festival last year. Blue Fox Ent. 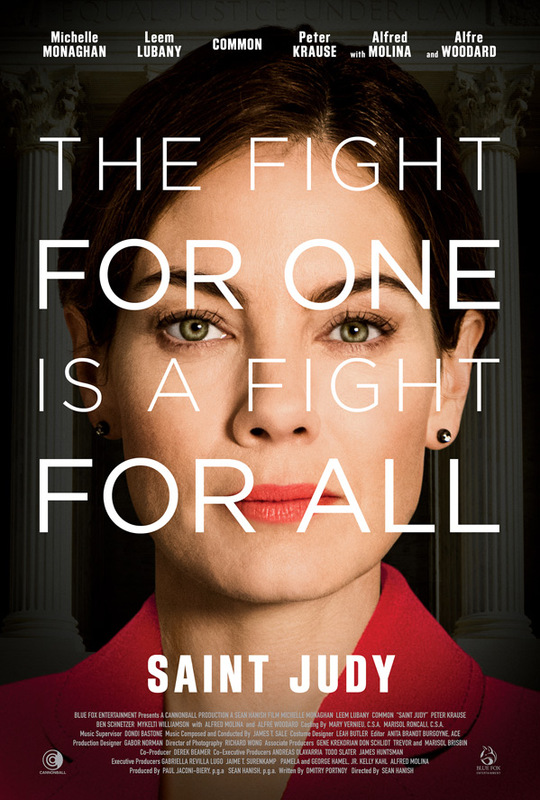 will open Hanish's Saint Judy in select US theaters starting on March 1st. Interested?